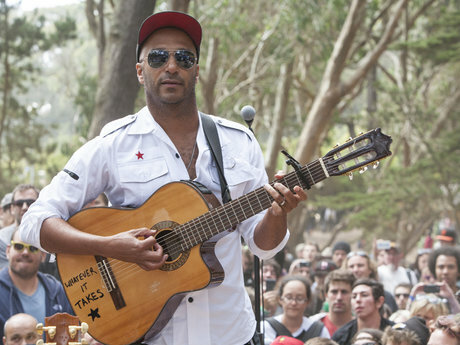 Tom talks about this nylon string guitar in [this *Music Radar* article](http://www.musicradar.com/news/guitars/tom-morello-discusses-his-history-with-the-acoustic-guitar-567409/) saying "That ended up being the Galvador, which turned out to have a really beautiful sound. Much of The Nightwatchman catalogue was composed, from that point forward, on the Galvador, because it did have a pickup – you could plug it in anywhere. I went on a tour in 2003 with Billy Bragg and Steve Earle, and with the Galvador I could be a professional performer (laughs). So it's the 'Whatever It Takes' guitar." No reviews or videos yet for Ibanez Tom Morello's ''Whatever It Takes'' Galvador Nylon-String Guitar. With an Equipboard account you can rate this item, add it to your collection, submit a review to discuss what you like and dislike about it, and associate Ibanez Tom Morello's ''Whatever It Takes'' Galvador Nylon-String Guitar to artists that use it. Create an account!